Tucked near the southern edge of Sarangani province is a small, sleepy town with a rich and colorful culture; whose richness is only matched by its equally beautiful mix of well-preserved tradition and reserved natural tourist destinations. The town is named Malapatan, which means “mala” - pepper and “fatan” place in Blaan. Malapatan’s unique culture is mainly borne out of the diversity of culture that is inherent in the place. It is inhabited by the three major cultural contributors namely the Blaans (first inhabitants), Maguindanaons (Muslim pilgrims) and the mostly Christian group of immigrants that first settled in the area during the land settlement years. In its 45th foundation anniversary last June 21, the inhabitants of Malapatan showcased how all this colorful cultural contribution is now interwoven and integrated itself into what we now know as the unique festival called “Pakaradyan”. Among the most unique and vibrant features of the Pakaradyan is the Guinakit Festival – a fluvial parade of colorful boats to commemorate the arrival of Shariff Kabungsuan in the 16th century to establish the first sultanate of Maguindanao and preach Islam in the Philippines. Engr. Tita Suib, municipal planning officer and tourism officer, said they plan to expand the Guinakit parade by the sea so that all barangays of the town will have an entry in the coming Pakaradyan. 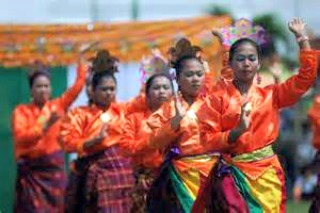 Aside from the Guinakit, the town also boasts of the tribal celebration during the Pakaradyan Festival – a special celebration where each tribe is given a whole day to showcase their culture. In an interview during the culmination of the Pakaradyan Festival, Vice Mayor Jimmy Bagit said that they purposely have three tribal days so that all tribes can be proud of their unique contribution to the culture of the town. He added that in the Pakaradyan Festival you can experience the different culinary delights of the tribes such as the Tinagtag of the Maguindanaon’s, the Palapa, Tangigue Steak and sweets laced with coco sugar. And what Philippine tourist festival would be complete without the street dancing? In Malapatan, they call it the Kadindang sa Lalan or dancing in the streets. In the end, the Pakaradyan Festival of Malapatan is much like the product of the famed Blaan "dream weavers" of the place who make sleeping mats based on designs they have dreamt off – from the dream of the early ancestors who made a pact to live separately as one in the place full of peppers; respecting each other’s culture and intricacies and silently build together a community where all is unique just like everybody else.